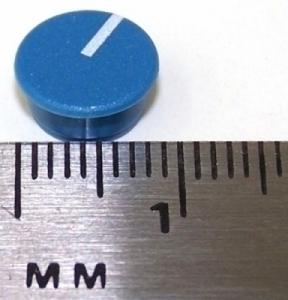 Exact replacement blue cap with white line as used on many dbx modules. Used by many manufacturers of pro audio gear, good for DIY projects. Top rim diameter is 9 mm, bottom diameter is 7 mm, height is 4 mm. Used with all 10mm top / 11.5mm bottom collet knobs. This item is not returnable.